Problem: Of the estimated 500,000 smokestacks in the United States, 47,500 represent up to 75% of untapped waste heat at above 500 F. This waste heat could generate at least 50,000 megawatts of power. Utilizing this waste heat could generate more than $100 billion in gross revenues. Solution: TransPacific's custom designed technology targets this market by capturing waste heat and efficiently converting it into power from flue gas at temperatures between 250 F to 500 F. TPE can also efficiently recover waste heat at temperatures higher than 500 F. TransPacific Energy’s power plant retrofits create electricity that can be used in industry or sold back to the utility company at regulated rates, with a high rate of return on the initial project investment. Problem: Previously other markets such as geothermal and thermal solar required a minimum of 300ºF to cost efficiently produce energy. Solution: TPE's technology permits cost efficient recovery of waste heat at temperatures lower than 200º F . TPE's ability to use such low temperatures, means abandoned oil wells that have been capped could become viable energy producing opportunities. Our Unique Difference: TransPacifc Energy has developed a patent on heat recovery/energy conversion system that produces electricity from many heat sources. These include, hot flue gases from process industry, biomass, landfill, solar, geothermal, gray water/hot fluids and warm ocean waters. 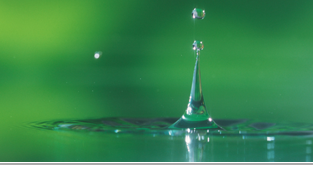 The system uses custom tailored advanced Organic Rankine Cycles (ORC) with a patented, environmentally sound multiple refrigerant mixtures. This custom tailored design maximizes power production and can easily be adapted to a broad range of heat sources and temperatures. TPE's technology can be used where other refrigerants such as ammonia, propane, butane and other HCFCs and HFCs have limited applications. TPE's process directly captures and converts heat directly from the heat source, without any heat transfer fluids (Binary Cycle), at temperatures from 80ºF up to 900ºF. This is a far broader range than any other ORC systems on the market. Other ORC's are limited to temperatures of around 200ºF to 350ºF. Because of the limited temperatures, other ORCs must use a binary system or secondary heat transfer to recover waste heat at higher temperatures. 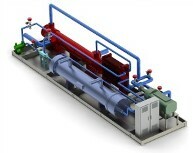 Using a binary system or secondary heat transfer significantly reduces heat recovery efficiency and increases costs. 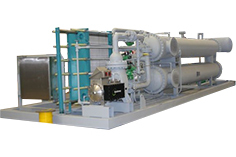 TransPacifc Energy’s technology eliminates the need for a binary heat exchange system or secondary heat transfer. This is because TPE recovers waste heat directly and at much higher efficiencies. - Enhanced heat to power efficiency, availability higher than 98%. 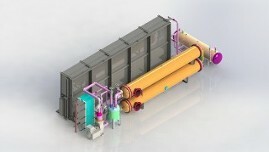 - Use of air-cooled condensers, if required, instead of cooling towers to reduce cost. - Easy to install, limited footprint, low maintenance cost, simple automated operation. 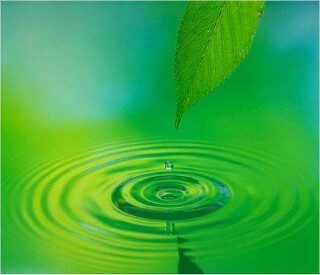 - Reduced carbon emission and green house gases and produced zero acid rain.